Paul's version of a Teco Pottery Lamp stained glass shade. 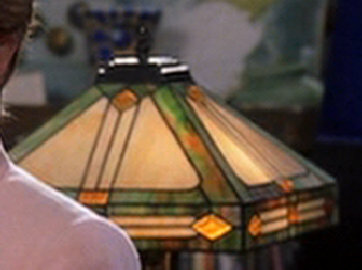 Princess Diaries Stained Glass Lamp on 1930's Rembrant lamp base. 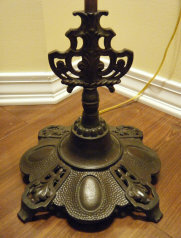 Iron base on antique Rembrandt lamp. Princess Diaries Lamp on 1930's Rembrant base. A year or so ago I re-watched the movie "The Princess Diaries" starring Julie Andrews and Anne Hathaway. There was a scene in the movie (see left picture) with a beautiful Mission style stained glass lamp that I just had to build. I have never built a square Mission style lamp, so I added it to my "future project list". Having grown up poor, I learned paying projects always come first, so a year later I finally had a chance to try to duplicate this lamp. This was an interesting challenge as I only had the picture from the movie to work with. I made a taped together cardboard template to work out the dimensions, drew the 4 repeat pattern, and started construction. The blown up picture on the right was my guide. Above is my version of this lamp. It was finished in August of 2010, measures 14" square, 9" high and contains 116 pieces of glass. Although this stained glass lamp shade would go well with a table lamp base, I had a beautiful 1930's Rembrandt brass and iron floor lamp that badly needed this shade. The combination worked well, so this lamp is now proudly on display in my home. Paul Collins contacted me in February of 2013 and said he was interested in building my Princess Diaries lamp. We exchanged several emails about construction techniques, glass colors, etc. to help with his project. Paul promised to email me pictures if he built the lamp. I talk to a lot of folks about glass projects like this and rarely hear back..... but......almost a year to the day, Paul sent an email about the lamp he built ..... and a picture (on the right)! I was excited to see what a wonderful job he had done in building this lamp. He used most of my original glass colors and did an absolutely fabulous construction job. 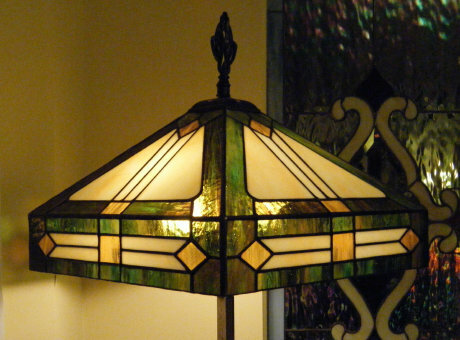 Building a stained glass lamp is much more difficult than building a flat window. He used a Mission style base like would have come with an original period lamp. I am proud to show off Paul's work on my site. Congratulations to Paul for the fine workmanship on his beautiful lamp! 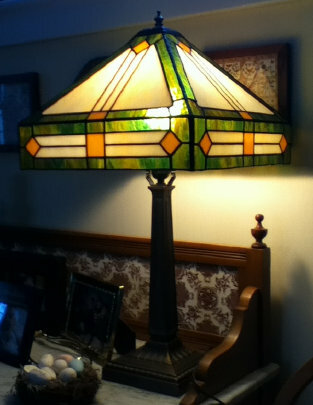 Paul contacted me again in February of 2017 and sent a picture of a Prairie style Teco Stained Glass lamp shade he just finished. Teco Pottery lamps were popular in the early 1900's and were originally oil lamps with a pottery base and stained glass shades. Most have been converted to electric lights now and are quite valuable. Again, very nice workmanship Paul! Job well done!